With the Holidays comes a sugar overload. At least that’s how it is at my house… and why not? Christmas is only once a year! But do you ever wish that some of those Christmas goodies could last into the New Year? Well, I am sure your neighbors do too. A great way to give a gift that can be used immediately or down the road is a gift in a jar. 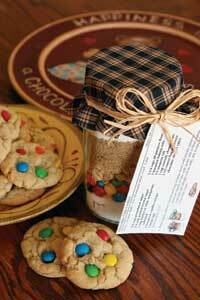 You can make all different kinds of mixes into festive Holiday gifts for your friends and family. Try soups, cookies, brownies, cocoa, pancakes, and even cakes. Gifts in a jar are not only a benefit to the recipient, but also to the giver. Just think, you could have these gifts made weeks in advance and hand them out whenever the time was right. 1. Gather the supplies. You’ll need clean canning jars, lids, bands, ingredients, a funnel, and a tamping tool. 2. While the large opening of wide-mouth jars makes them the jar of choice, you can easily make due with other jars. In fact, gifts-in-a-jar may be the perfect solution for recycling glass mayonnaise jars that cannot be used in home canning. 3. If you don’t own a funnel, roll a square of parchment paper, or even just writing paper, into a cone. Insert the narrow end into the jar, and then pour the ingredients through the wide opening down into the jar. 4. The tamping tool is for compressing the ingredients in the jar without disturbing the layers. Use anything that will fit into the mouth of the jar. Try the back of a spoon, a small, clean fist, or a wooden pestle. 5. Use only high quality ingredients. Now is not the time to get rid of those rock-solid marshmallows that have been reclining in your cupboard for the past two years. You want friends to have success with the recipe when they bake it up because it will reflect back on you. Therefore, use fresh, tasty ingredients that will ensure good flavor, even if recipients wait six months before opening the jar. 6. Think through the order of the ingredients when layering. Place finely textured ingredients on the bottom and chunkier textured ones on top. In this way, the fine ingredients won’t filter down through the others, losing the layered appearance. For example, if you are making a chocolate-chip cookie mix jar, place the white sugar and flour at the bottom of a jar. Put the chocolate chips atop those fine ingredients. If you placed the chocolate chips at the bottom, the sugar and flour would filter down through them, turning them white and gritty. Brown sugar, when compressed, can be a dividing layer in mixes. This means that you can place flour and granulated sugar atop the brown sugar with no worries of it filtering down to ingredients below it. 7. For the best appearance, tamp the individual layers of ingredients down before adding another ingredient. This will not only help you fit all the necessary food in the jar, but it will also help define the layers. Getting rid of any excess wiggle room will keep the layers attractive during transportation and the gift-giving process, too. 8. If you aren’t concerned about layers (as in a jar of pancake mix), simply shake the ingredients down to get in as much as possible. 9. Consider placing a “Best if Used By . . .” date on the gift if you fear ingredients will lose their quality during storage. 10. Make extra jars to put under your own tree for those moments when you hear “Oh no, I forgot to get a gift for so and so.” Consider even addressing some jars to yourself to keep ahead of the when you hear, "I need a treat for the basketball team tomorrow." Think beyond the Christmas box (or should I say jar), too, by retrieving these ideas year round for birthdays and special occasions.